How to freeze eggs, home-raised or otherwise, so you can use them in all your favourite recipes. So we returned from our Winter celebrations with family, to find the hens had left us a further seasonal gift. Of course you don't need to have a flock of chickens to accumulate eggs but it helps. Given that before we went away, this was my mother's main request for things to bring with us, we weren't surprised to find every supermarket we visited and even the local village shop, sold out of organic eggs. Forget fiat currency, it is the former that are worth their weight in gold and so here's a tip on how you can bank them in your freezer and preserve their nutritional value for those potential lean months ahead. If you have your own chickens, then you will know the taste difference between home-raised organic and organically certified eggs because these latter are from hens fed on a fixed approved diet of pelleted grains and pulses, whilst ours, for example, are paleo omnivores. Although our chickens do eat organically certified grain, it is sprouted and thus nutritionally different than dry grain. In fact our hens hated organic layer pellets, on the one occasion I decided to feed them some. Thus, even though part of their protein requirement comes from cultivated cereals, the remainder is well supplemented by invertebrates from our compost heap and whatever our poultry can find or catch, scratching around our garden. That is not to suggest that commercially produced certified organic eggs are not good quality food, they are but they are just not as good as they could be. Pastured hens put such a lot of effort into foraging to produce quality eggs and if you knew how much they wanted to turn those into chicks, then you would value them equally. So how have I got a glut of eggs in the middle of Winter? Well although some of my older hens do lay in the Winter, in addition to them I have a whole raft of new layers just becoming old enough to start laying. 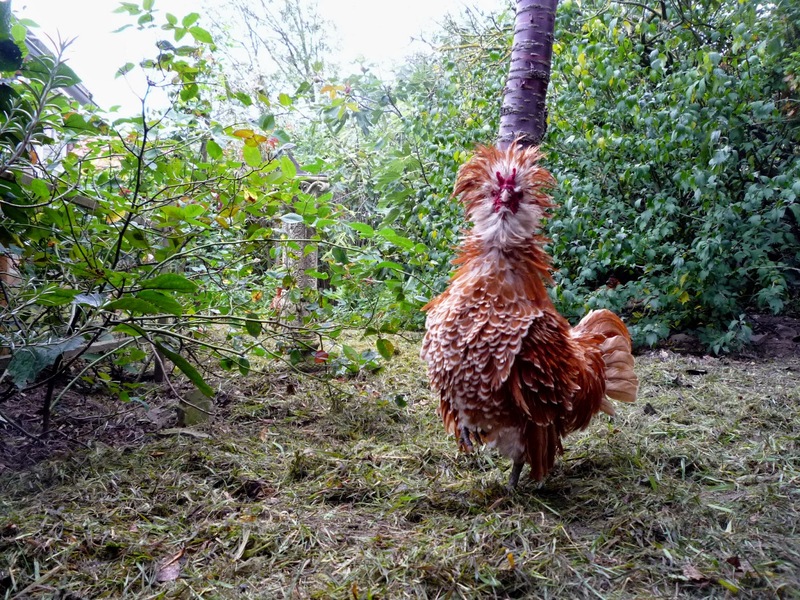 We have a forest garden, where hens can sometimes and for this last year read 'often', hide their eggs. The little chick sitting partly hidden behind 'The Egret' and pictured here above, in early May, has now turned into this big chick below, who is presently laying every day and no doubt planning a clutch of her own in early Spring!. For each of the three though, the eggs should be blended together with a fork so as to form a homogeneous mixture. In the case of 4 yolks or whole eggs, I add a pinch of raw sea salt or a quarter to a half a teaspoon of raw cane sugar, according to the eventual use of the eggs. If you are freezing in larger amounts, scale up accordingly. Frozen this way, eggs will remain as versatile an ingredient as when fresh and as recommended by Mrs Beeton, can be kept in the freezer for a year. The first thing I always do with eggs I am going to freeze as whites and yolks together, is weigh them. Home raised-eggs can vary in weight immensely, unless perhaps from a uniform flock of a single Utility breed of standard size hens and even that is not guaranteed. As the eggs I am freezing are to be used in different recipes, I firstly weigh them, in shell, allowing 55g for a standard egg or 75g if the recipe calls for an extra large egg. Although my hens are mostly bantams and thus it can take 3 of my small bantam eggs to make one 'standard' egg, this is not a fixed equivalent. I remember my Father once asking me how many eggs I was putting in a cake and replying, 24! However, some of my bantams regardless of their own physical size, can and do lay standard eggs and my Polish crested, though half-standard birds, thus smaller than the usual standard laying hens, can lay extra large eggs! So to avoid confusion I weigh all eggs for my recipes and thus for convenience, when freezing them often mark them 'recipe ready', with our eggs reclassified as 'standard'. When needed, eggs can be left to thaw and then used just as if fresh. I have never had any difficulty in, for example, whipping egg whites to make meringues or ratafias (below). I have also read various accounts of freezing egg yolks, with the oft repeated suggestion that large volumes, i.e. tablespoons of sugar are needed to freeze them successfully. I have never found this to be the case. In fact as organic sugar is so much sweeter than non-organic, that amount of sugar would, for me, make the egg inedible even within a recipe. Pancakes are a favourite Winter breakfast with us and I would challenge anyone to tell the difference either when cooking or eating between those (as below) made with frozen eggs. In this case, we decided on pancakes at the last minute, so these eggs were actually thawed in a bain-marie of warm water. Now if you'd like to sit back and watch the hatch of this year's new layers, who generously provided us with a glut of eggs. So next time your hens present you with an embarrassment of riches or you are just unsure if you are going to use all the eggs you have purchased, don't let it worry you, stay cool, just put them on ice. 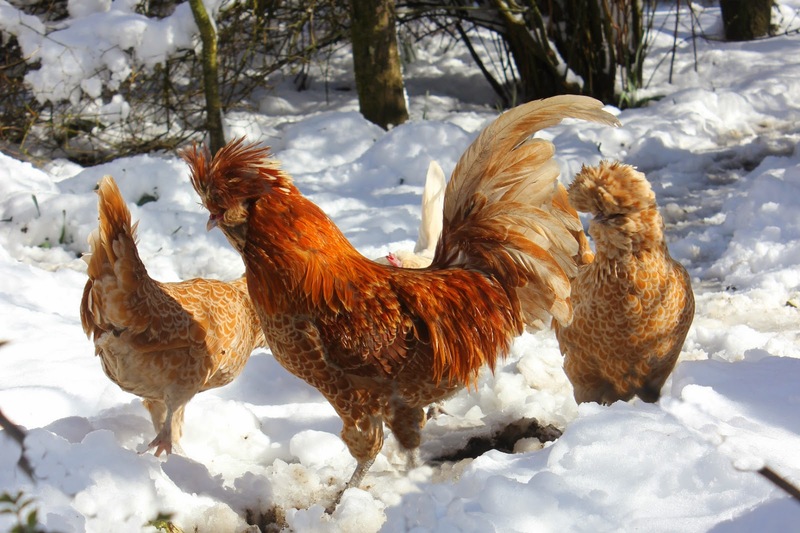 Choosing Chickens for a Garden, Smallholding or Homestead - Old Breeds and Organic - a winning combination in your backyard.